(1 of 4) Adams House, encompassing buildings ranging from Colonial America to Harvard’s Depression-era creation of the House system (and trisected by city streets), poses design and construction challenges as renewal nears. (2 of 4) This conceptual design outlines the newly envisioned east-west circulation through the complex; relocated and expanded student spaces; an enlarged dining area; and, above the dining hall, a proposed student-activity loft—to be accessible via one of eight new elevators. (3 of 4) A cross-section of the proposed student-activity loft space, created by raising the roof over the dining hall while preserving its naturally illuminated light wells. The design will be further refined, and must be reviewed and approved by Cambridge authorities, before phase III construction proceeds. 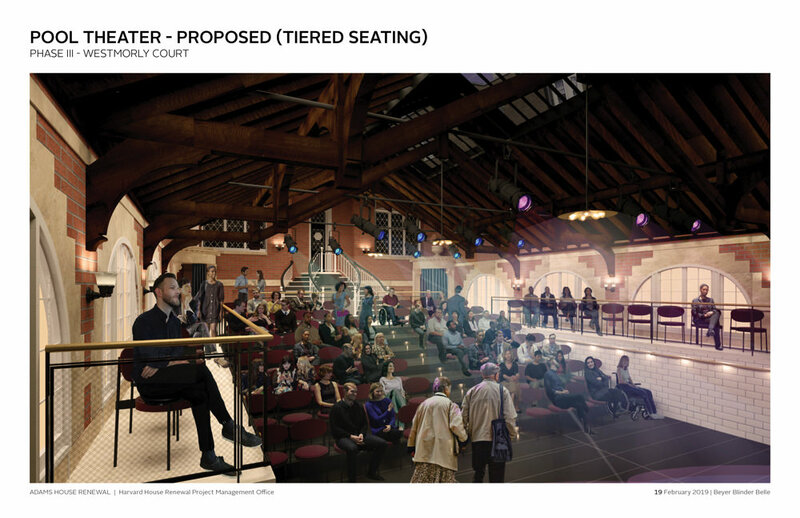 (4 of 4) A rendering of the proposed renovation of the Pool Theater, showing flexible riser seating (which could be folded away, making the flat floor available for other functions or productions), and modern stage lighting. The renovation plan also accommodates storage, a backstage and green room, and an accessible entry—all lacking now. During a forum with Adams House residents on February 19, Nathaniel Rogers ’05, a project architect from Beyer Blinder Belle (BBB), reviewed the plans drawn to date for the three-phase renewal of the 450-student residence, beginning this summer (when work on Lowell House, shown here, will conclude) and scheduled for completion and final occupancy by August 2023. As envisioned, the plans—not yet all in final state—would effect improvements ranging from the routine (overhauling antiquated infrastructure, enhancing rooming arrangements) to the innovative: imagining how to connect community members with each other more readily within the House (better circulation and access) and how to enhance student-activity space (including upgrading the cherished pool theater and constructing a proposed “loft” above the dining room—subject to refinement and, ultimately, Cambridge regulatory review). It comprises six separate structures—dating from 1760 (Apthorp House) to the early 1930s (Russell Hall and the Library/Commons)—built for varying purposes, ranging from the luxury “Gold Coast” residences once rented to rich students, to the two latter structures, the only ones erected by Harvard and purpose-built as part of the adaptation of the whole group of structures into a House. Reflecting its past, it is unusually richly decorated, with many prized motifs and materials, all meriting special attention. It is more crowded on its site than the River Houses, and divided internally by Linden and Plympton streets. Accordingly, construction will be complicated by the unusually tight quarters and constraints on access (for example, minimal courtyards for staging equipment and materials). And as a practical matter it is impossible to add residential space (as was done with new construction, for example, in the Winthrop House renewal). Furthermore, the whole complex is densely inhabited, with 450 student residents (compared with a designed population of 350 or so), putting a premium on solutions that enhance common areas, improve circulation, and satisfy modern requirements for accessibility and mobility—without sacrificing dorm capacity. These objectives must be met without reclaiming significant basement areas, as in prior renewal projects: Adams, for the most part, doesn’t have them. And, facing Bow Street, its legacy Gold Coast entrances are above-grade, accessed by staircases or stoops: no longer an acceptable solution. But given that Adams sprawls across three separate blocks, the renovation presents some opportunities not available to prior whole-House renewals, where the entire community has had to relocate to swing spaces for the duration (Lowell’s current circumstance). 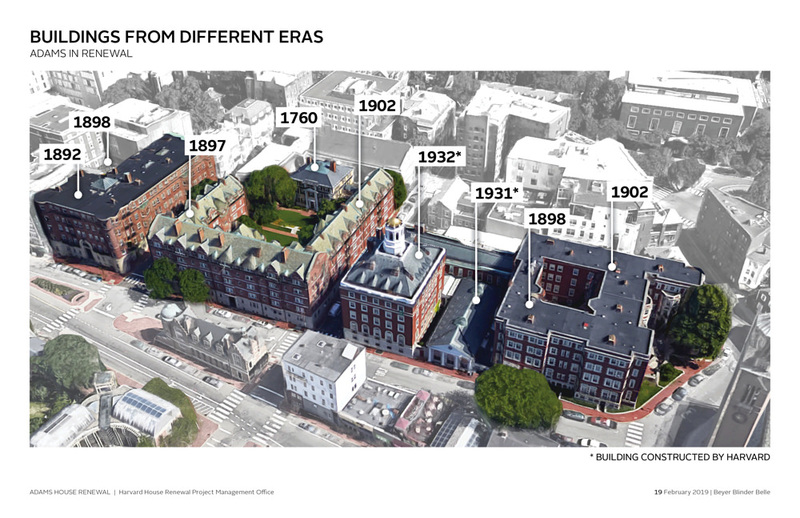 During phases I (Claverly Hall and Senior House, June 2019 through summer 2020) and II (Randolph Hall and Apthorp House, June 2020-summer 2021), only a portion of the resident student population will be in swing housing, so it can be relatively compact and nearby (the former Inn at Harvard, 1201 Massachusetts Avenue, plus 8 Plympton Street and 1306 Mass. Ave.)—and the Adams dining room can remain in operation, a center for community life. Students will not be dispersed to other swing spaces along Prescott Street. During phase III (Russell Hall, the Library/Commons, and Westmorly Court, June 2021-Summer 2023, a period extended to accommodate the new construction associated with the proposed loft space), dining will need to relocate to the repurposed Inn at Harvard swing space. In a conversation about the plans, Rogers and Merle Bicknell, the Faculty of Arts and Sciences’ assistant dean for physical resources, covered everything from alleviating substandard conditions to rethinking how the House operates. Given the variety and vintage of the buildings involved, Rogers said, there are “no typical conditions” at Adams House: the renewal involves a “tailor-made strategy” for each building. But accessibility and House connectivity overall will be augmented significantly in two other ways. First, eight elevators will be installed. Second, by making use of existing means of entry and egress—not all of which connect coherently—BBB has conceived an east-west circulation framework from Claverly Hall (Linden Street) and Randolph Hall over to the Russell/Library and dining/common spaces block. (There is an existing underground connection beneath Plympton Street; utilities underneath Linden thwarted the architects’ attempts to design a similar one under Linden.) Rearranging some through-ways and removing obstructions makes for a more unified way to transit the House. The Gold Coast apartment buildings were “never built with an intention to relate to each other,” Rogers noted. Now, they will more nearly do so, despite the intervening city streets. 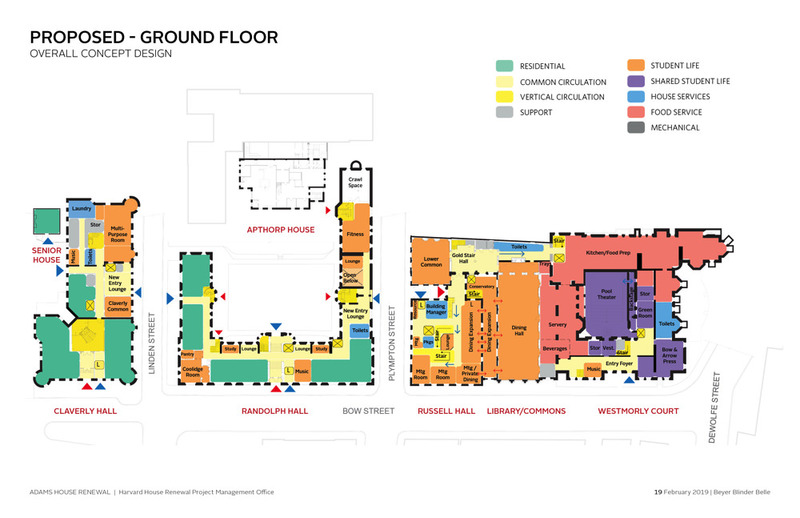 Student-life spaces will be enlarged in various clusters: the northeast portion of Claverly (on either side of a new entry lounge and elevator facing Linden Street); on the Randolph wing closest to Apthorp House, again with a new entry lounge facing Plympton Street); and especially on the ground floor of the block containing Russell Hall, the Library Commons/ and Westmorly Court. New space west of the dining hall, in a glass-enclosed, covered light court, will accommodate an expanded dining area. Meeting rooms will face Bow Street and Mount Auburn. 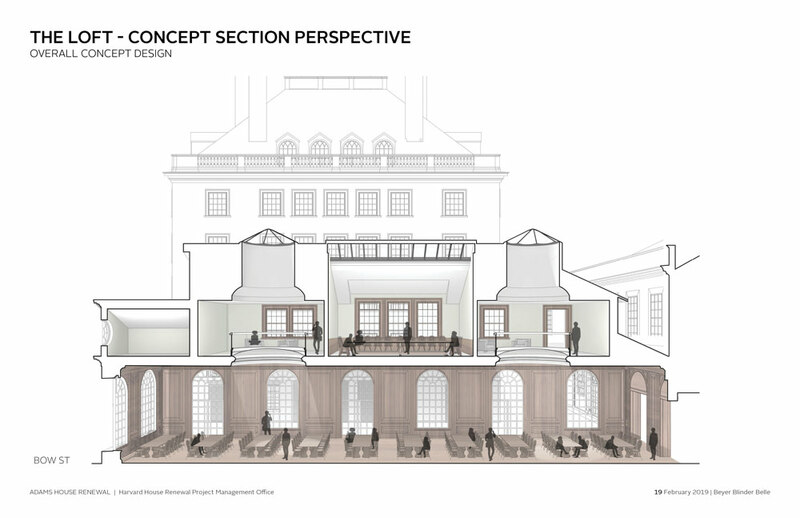 And above the existing dining hall, the architects envision the raised roof and new loft: a multifunction space (preserving the “laylight” wells that admit natural illumination into the dining hall, below) that could lend itself to meetings, lecture use, or even overflow or private-function dining. Access to it, and the nearby library and upper common room, would be by a new elevator. Planning is further along for phase I than for phase III, so loft details are tentative at this point, and in any event will have to undergo review and approval by the Cambridge Historical Commission. Depending on how the final phases of construction progress, Rogers said, it is possible that the dining hall and loft portions can be completed during the final academic year of the project, but that students would not return to Adams from their swing dorms until classes resume in August 2023. During earlier consultations with Adams residents, Rogers said, students emphasized their House’s special character—most vividly in a request to “keep Adams weird.” The function of the House’s beloved Pool Theater, a distinctly “weird” amenity, is being embraced and enhanced. In current plans, the theater will gain an accessible entry; backstage and storage space, including a green room, making for a fully functional theater; and adjustable riser and ganged seating, accommodating flexible production layouts and multiple uses (the flat-floor configuration could be used for a dining function, a House formal, etc.). Although much of the original texture of the theater has been lost in prior renovations and adaptations, its functional improvement is fully in the spirt of the planners’ aim, as Rogers put it, to retain the Adams buildings’ “richness of textures, materials, and designs,” while fitting them up for their next 80 years of use.